At the church that my wife and I were members of, the pastor put a lot of emphasis on male leadership. One of the heavily pushed programs for men was called Christian Leadership Concepts (CLC). The structure is for 12 men to bond together and meet weekly for two years, going through a prepared study and curriculum. The desired result is to become better leaders at church, home and work. A side benefit is that you develop life-long relationships with the 11 other men. Those who complete the two year commitment are held in high regard. Women long to have their husbands participate in this program. My wife was no different, and after a year or so of dropping hints, I succumbed, joining a CLC group. As a matter of fact, I was a co-leader of the group. I have leadership skills, both by nature and by training, so I figured it would be no big deal. But as I was preparing to lead the first meeting, I experienced what I recognize now as a first crack in the “feet of clay” of my faith. Looking over the material, I asked myself, “Do I really believe in all this? Do I believe that Jesus was resurrected from the dead by the power of the Almighty God?” This was quite a strange feeling after having been a Christian for three decades, and putting myself out there as having faith on an apostolic scale. I felt a wave of anxiety overtake me. My heart was pounding. I had shortness of breath. I was having a panic attack. My mind was racing - what were the implications if the resurrection of Jesus was just a story that really wasn’t true? That all of Christendom believed in a myth? That I did not have the gift of everlasting life? That I would cease to exist as I took my final breathe? That my marriage was based on a lie? That I raised my children to believe a fairytale? This was too much to think about. I told myself it was the Devil. He was casting doubt in my mind, and it would pass. It had to be an attack of the Devil. I caught my breath, and all was fine. At first, CLC was fantastic. The first book on the agenda was A.W. Tozer’s The Pursuit of God. Deep stuff. The first study module was “A Man After God’s Own Heart”. The 12 men were going great guns. We were all finally doing it. Our wives were loving it. We could tell others we were in CLC. We were looked up to and admired. But the thoughts that set off that panic attack would crop up every now and then. Did I really believe this stuff, or was Christianity just another man-made religion? The deeper the study got, the more I told myself, “You have to really believe in order to accept what this study is telling you to do.” The idea of who Jesus really was kept coming up. Who was he really? And did that differ from who I perceive him to be? What if he lived today in modern times? I would think him to be a cult leader. I have known men like him. Miracle performer, or magician? How hard would it have been to trick the people of first century Palestine? And once the stories were told, how great could the legend grow? If Jesus was just a charismatic man with a group of followers, and those followers promulgated their believe that he was deity, then Christianity is no different than Islam. 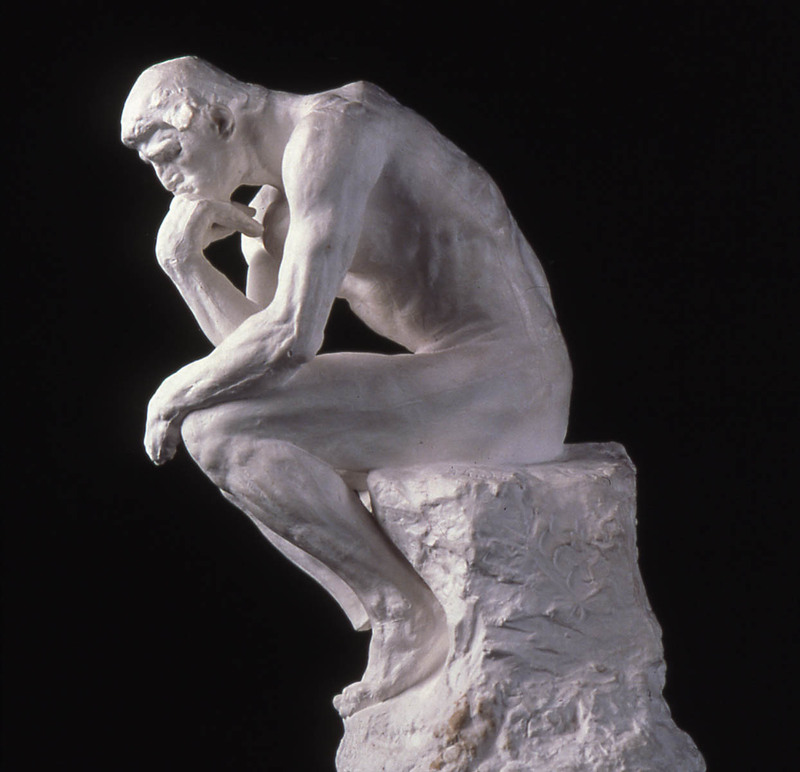 Was I a believer just because others who were deluded taught me to be? Was this system of faith, made up by Abraham and cultivated by Paul, invented only to explain why God is so silent? Does this explain why my conversations with God are decidedly one-sided? Who invented this cosmic system that the way you think and believe would have eternal consequences? Why do the writings of men thousands of years ago hold any more validity than the thoughts in my head? Why would a Hindu or Budhist burn in hell for not believing Jesus resurrected from the dead? If Jesus resurrected from the dead, then where the hell is he? Oh, he “ascended” into heaven… how convenient! If we have to believe in Jesus, what exactly is the cut-off? For years I had believed that if you didn’t believe in Calvinism, then you’d better invest in asbestos. Then I became more moderate, and thought that some freewill-ists might make it to heaven… but no Catholics! Well, my wife knows two Catholics who she thinks are real Christians… Oy-vey! The rules keep changing! At least I know I’m going to heaven! How arrogant is that? At every moment in the history of man, the population could be divided into different religions. 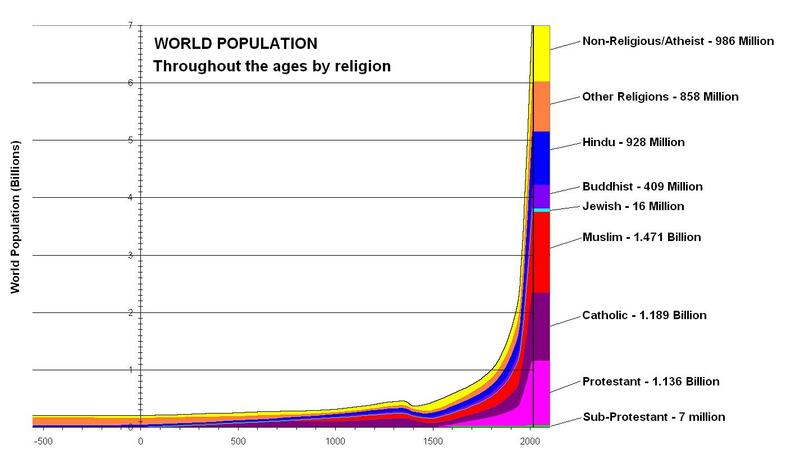 The current proportions of each major religion are very well known. And you can certainly trace several of those to their beginning, such as Islam and Christianity. What if I took the world population graph and colored in the different religions? I looked up some numbers, and found it was pretty easy to populate. It was just an approximation, but it couldn’t be that far off. I looked at the graph showing Christianity. It could easily be divided up into Catholic and Protestant. Protestants can be divided into many denominations, so I’ll include one sliver of a populace that for me represents Calvinists, but it could be any denomination. For present day, I included actual numbers rather that percentages so I could see how many people I have been sending to Hell by my faith. I looked at the graph. This was God’s plan? The small sliver of the sub-Protestant group were the lottery winners? All the other people were losers? My faith continued to unravel. As my faith crumbled, I had to rethink my staunch positions on issues such as abortion, free contraception and homosexuality. For thirty years, I regurgitated what I was taught – that abortion was murder, contraception in schools was evil, and homosexuality was an abomination. But now? I believe abortion, contraception and homosexuality are merely dampening mechanisms to the exponential growth of world population – and thank god for them! They are certainly preferable to wars, disease and starvation.